Chapter Nine — Life as a Religious Sister — My Catholic Life! Dear Mother, I thought I had written enough, and now you wish for more details of my religious life. I will not argue, but I cannot help smiling when I have to tell you things that you know quite as well as I do. Nevertheless, I will obey. I do not ask what use this manuscript can be to any one, I assure you that even were you to burn it before my eyes, without having read it, I should not mind in the least. It’s important to note, once again, that Sister Thérèse wrote out of obedience, not to glorify her own soul. Additionally, she was beautifully detached from what she wrote: “even were you to burn it before my eyes, without having read it, I should not mind in the least.” Imagine if Mother Marie were to burn her manuscript, right before the eyes of Sister Thérèse, without even reading it. For most people, this would strike deeply at their pride and would be the cause of sorrow and even anger. But it wouldn’t have been the case with Sister Thérèse. Though that is not what happened to this second manuscript, ponder the possibility of Sister Thérèse witnessing such an act. Perhaps some small sin of pride would have arisen, but her heart was so detached from vanity and the opinion of others that she would have quickly rejoiced in such a humiliation. She would have rejoiced that God gave her such a grace to act in holy obedience and that only the angels and saints would have seen all she wrote. Reflection: How would you react if you were asked to pour out your heart on paper and then all you wrote was burned before it was ever read? Have you shared your heart with another, only to be ignored or misunderstood? This is a common struggle and can be the cause of hurt and sorrow. It’s important to understand that, even though it is not virtuous for another to dismiss the content of our heart and show little interest in what we share, our peace of soul ought not depend upon another’s reaction. We must seek to have the same detachment from the listening ear of another as Sister Thérèse had in regard to her manuscript. If the sharing of her soul was read, understood and loved by one or by many, so be it. If her sharing was burned and left unread, so be it. Reflect upon how attached you are to the interest or disinterest that others take in you. Certainly it is a blessing of love when another takes interest in you and wants to understand you. But unless you can view others’ reactions to you with detachment, your sharing will not be a freely-given gift. Sister Thérèse did not write with the expectation that others would benefit from what she wrote nor did she do so for attention or vainglory. She wrote out of obedience and love, and this total gift of her soul was ultimately received by many and continues to be received by many more today. Dearest Saint Thérèse, you shared your heart freely and openly, for Jesus truly lived within you and His love shone through you. Pray for me, that I may willingly share all that God has done in my life with those who seek to understand. May I also have patience and detachment from this act of love so that I will share only that which our Lord inspires me to share. Saint Thérèse, pray for us. Lesson: As Sister Thérèse grew in holiness, those around her began to perceive her as a pure soul who was living in the Heart of Christ. Her holiness radiated, and those who had the eyes of faith could see this. Mother Marie was difficult on her at times but for Sister Thérèse’s own good. It was an act of love so that Sister Thérèse would not grow proud. Mother Marie also expressed her love and respect for Sister Thérèse, and she manifested much confidence in her genuine holiness. Additionally, various other sisters, as well as associates of the convent, were aware of the spiritual depth and beauty of this Little Flower of God. How did Sister Thérèse respond to this? When I say that I am indifferent to praise, I am not speaking, dear Mother, of the love and confidence you show me; on the contrary I am deeply touched thereby, but I feel that I have now nothing to fear, and I can listen to those praises unperturbed, attributing to God all that is good in me. If it please Him to make me appear better than I am, it is nothing to me, He can act as He will. Sister Thérèse had such a deep love of God that His “opinion” was all that mattered, since His opinion was Truth itself. As for the admiration and praise of others, this was deeply touching to Sister Thérèse, since their love and affection was an act of the tender Heart of God. But she also had a “holy indifference” to the opinions of others, even when those opinions were good opinions. Sister Thérèse teaches us the beautiful lesson that we must be truly indifferent to others’ praises if we are to be able to receive their love and affection in a meaningful way. Holy indifference means we do not depend upon what others say or think, but when others are drawn to our virtue, we rejoice at the expression of love they share. Only if we have a holy indifference can we receive the love and even praise of another with humility and joy. Reflection: Do you seek the praise and admiration of others? Do you allow yourself to become dependent upon what others think about you or even say about you? This can be a heavy burden to carry and will always leave you feeling unsatisfied. On the contrary, if you seek to have a holy indifference in your relationships, you will find that every shared act of love will be a joy. However, if you do not receive praise and affection, you will not be disappointed. Holy indifference is essential to every relationship of love. Without it, freedom is lost and selfishness determines our decisions. Reflect upon your relationships, especially your closest ones. Pray that your praise for them will be purely for the sake of love and not for any selfish motive. It’s true that when another gives you praise, you are blessed. But be careful not to count on this or make the praise or lack thereof determine your response. Seek a holy detachment, so that all that is given and received will be free and holy. Dearest Saint Thérèse, you did not allow your actions to become contingent upon the praise of others. If they loved you and praised you, that was fine. If they did not, that was fine also. Pray for me that I may discover and live this beautiful and mysterious virtue of holy indifference. May I seek to love for the sake of love alone. Saint Thérèse, pray for us. Lesson: Sister Thérèse spent the last two years of her life discovering and sharing the deepest wisdom of God. One gift that she discovered within her soul was a desire to become a saint. And though she realized that she could not do this on her own, she also understood that “God would not inspire desires which could not be realised…” Therefore, Sister Thérèse set out on the mission of discovering how God would enable her to become a great saint, despite her littleness and weakness. She pondered how an elevator was much easier and quicker than climbing stairs and that an elevator was necessary for those who were weak. Similarly, if she were to ascend to the heights of holiness, she would need a spiritual lift to Heaven. Her reflection on Scripture led her to conclude that this lift was received by becoming little and clinging to the arms of Jesus. Thine Arms, then, O Jesus, are the lift which must raise me up even unto Heaven. To get there I need not grow; on the contrary, I must remain little, I must become still less. Sister Thérèse’s new way was to embrace her littleness, weakness and nothingness. She had nothing on her own that could make her a saint. Therefore, if she could remain weak and little, like a little child, she reasoned that she would cling to Jesus in love and never let go. Though she was a sinner, God’s justice could not condemn her if she became small and weak. God would have no choice but to carry her to holiness and bring her to heights higher than she could ever imagine. A child is blind to its weakness when in the arms of a parent. It is trusting and is carried wherever the parent decides. Therefore, with complete confidence, Sister Thérèse concluded that this was the best and simplest way, the “Little Way,” to become holy. This is the path of “littleness” and centers on the perfect trust of a child. Reflection: Too often we pride ourselves on our virtue and strength. We allow ourselves to believe that whatever we set our minds to, we can accomplish. But are you able to achieve holiness on your own? Does not your sin already condemn you before the justice of God? Not if you turn your full attention to the merciful love of Jesus. Holiness is a gift, and Sister Thérèse, in her humility, knew she was incapable of attaining it on her own. Therefore, she sought to become little, to become “nothing.” Only in such weakness would she become irresistible to Jesus who would then carry her to the highest heights of holiness. Reflect upon your own attitude toward holiness. Do you fall into the trap of thinking that you can attain this by your own effort? Ponder the “Little Way” of this saint of God and know that it is the best way for you. Discover your weakness and nothingness and make a claim on the mercy of Jesus to carry you in your need. If you imitate this humble trust of Saint Thérèse, you, too, will have discovered this little way of love. Dearest Saint Thérèse, you discovered that becoming little, dependent and weak enabled you to make a claim on Jesus, abandoning yourself into His merciful love. Your trust was not on account of your own merit, it was because of the infinite love of God. Pray for me, that I may imitate your “Little Way” and may seek to become little and weak before the infinite mercy of God. Saint Thérèse, pray for us. Lesson: Though she was young, Sister Thérèse was given the responsibility of leading the novices, but she asked Mother Superior not to give her the title “Novice Mistress.” She happily obliged and Sister Thérèse committed herself to the formation of her sisters. You have said to me, as Our Lord said to St. Peter: “Feed my lambs.” I am amazed, for I feel that I am so little. I have entreated you to feed your little lambs yourself and to keep me among them. You have complied in part with my reasonable wish, and have called me their companion, rather than their mistress, telling me nevertheless to lead them through fertile and shady pastures, to point out where the grass is sweetest and best, and warn them against the brilliant but poisonous flowers, which they must never touch except to crush under foot. Mother Superior understood that the Divine Master had enlightened the soul of Sister Thérèse and given her the experience of years. This was one of the reasons she appointed Sister Thérèse to this responsibility. Given this assurance of her inner character, Sister Thérèse still realized that she could lead these novices only if she remained “little” and “wholly dependent” upon the mercy of God. God and God alone would lead His little flock through her. How is it, dear Mother, that my youth and inexperience have not frightened you? Are you not afraid that I shall let your lambs stray afar? In acting as you have done, perhaps you remembered that Our Lord is often pleased to give wisdom to little ones. Her youth and inexperience were not hindrances to Sister Thérèse; rather, they were the qualities she needed to be used so well by God. She led with tender love, firmness and mercy. Her little lambs opened their hearts to her motherly care. Reflection: It can be difficult to exercise discipline and tender love at the same time. Sister Thérèse did this well. How about you? Over whom has God given you responsibility? With whom have you been entrusted the task of acting as a shepherd? When exercising authority over others, there are many pitfalls we may encounter. Some long to be “liked” so badly that they are fearful of being firm, and they give in to pressure almost immediately. Others are harsh and overly judgmental or condemning and thus abuse their authority. Reflect upon the ideal balance of strength and tenderness, discipline and mercy, correction and forgiveness. Reflect also upon those for whom you have been given a certain moral responsibility in life. Perhaps you have civil authority, Church authority, authority within your family or authority at work. Authority means you must lead and “shepherd” in accord with the mind and heart of Christ. Ponder Saint Thérèse and seek to imitate her heart as she sought to imitate the heart of the Shepherd. Dearest Saint Thérèse, you loved your “little lambs” and sought to exercise a true motherly heart over them. You perceived the uniqueness of each one and loved each as she needed. Pray for me, that I may also exercise an authority of love over those whom God has entrusted to my care. May I imitate the Good Shepherd and lead my own “little flock” toward the Kingdom of God. Saint Thérèse, pray for us. This interior suffering that she endured enabled her to face her final martyrdom with much joy and anticipation. On April 2, 1896, the night of Holy Thursday, Sister Thérèse wanted to remain all night in prayer with our Lord, but she was denied permission to do so. Therefore, she returned to her cell and put out the light. Just then, as Sister Thérèse lay down to sleep, she felt what she described as a “hot stream” rise to her lips. She felt blood coming from her lungs, the first sign of her imminent death from tuberculosis. But her interior martyrdom of the past year prepared her for this physical martyrdom so well that she received this “hot stream” as a truly joyful announcement. At five o’clock, when it was time to get up, I remembered at once that I had some good news to learn, and going to the window I found, as I had expected, that our handkerchief was soaked with blood. Dearest Mother, what hope was mine! I was firmly convinced that on this anniversary of His Death, my Beloved had allowed me to hear His first call, like a sweet, distant murmur, heralding His joyful approach. Such a joyful, inviting attitude toward one’s own impending death is an attitude rarely seen. Very few people love God with such passion that they are “transported with joy” at the thought of their imminent demise. Sister Thérèse was one of those rare souls. Reflection: How would you react if you were to find out today that you have a terminal illness? This is a “heavy” question to say the least. Few would react as Sister Thérèse did because few are as fully given over to the love of God as she was. Though you might not immediately react to the news of your impending death as Sister Thérèse did, you can still reflect upon her joyous reaction and learn from it. Death is not frightening to those who love God and trust Him with every fiber of their being. If you find yourself somewhat frightened at the thought of death, do not worry. Instead, use this meditation as an opportunity to ponder why you would not react to such an announcement as Sister Thérèse did. What is it you fear about death? Why do you fear? Do you long to be with God in Heaven? Do you trust Him to care for your loved ones if you were to go to Him soon? Ponder these questions in faith and hope. God and God alone is the author of life and, thus, He and He alone determines when and how we pass. We must always be ready, watching, waiting and anticipating this great day with joy. That can only be accomplished if we love and trust God with our whole being. Dearest Saint Thérèse, your mind and heart were so consumed with the love of God that this first “announcement” of your pending death was received with incredible joy. Pray for me, that I may love and trust God so deeply that I will fear nothing in life, not even death. May I be filled with hope in all things and anticipate the glorious gift of being with our Divine Lord forever in Heaven. Saint Thérèse, pray for us. Lesson: Shortly after receiving much joy and consolation at the thought of soon being in Heaven with her Lord, Sister Thérèse received a different interior gift: months of interior suffering and darkness. …the thought of Heaven, which had consoled me from my earliest childhood, now became a subject of conflict and torture….I wish I could express what I feel, but it is beyond me. One must have passed through this dark tunnel to understand its blackness. In her attempt to explain what she went through, she offered a metaphor. She explained that the world we are in is a land of fog. We live here, unable to see, but have been told that this is not our land and that there is a glorious and beautiful land to which we will be taken one day. The thought and anticipation of such a land filled Sister Thérèse with great delight. She looked forward to Heaven! This lie echoed over and over in her mind during these months of darkness. While most people would see this as an awful experience, Sister Thérèse understood it as a precious gift from God. Why would God allow her to be stripped of all sensible hope of Heaven? Because this loss of all interior consolation provided her an opportunity to deepen her faith. And that is exactly what happened. I have made more acts of Faith in this last year than during all the rest of my life. Each time that my enemy would provoke me to combat, I behave as a gallant soldier. I know that a duel is an act of cowardice, and so, without once looking him in the face, I turn my back on the foe, then I hasten to my Saviour, and vow that I am ready to shed my blood in witness of my belief in Heaven. I tell him, if only He will deign to open it to poor unbelievers, I am content to sacrifice all pleasure in the thought of it as long as I live. Thus, the loss of all interior delights and the loss of all joy of Heaven did not discourage Sister Thérèse. On the contrary, this desolation afforded her the opportunity to make the most pure and most profound act of faith possible. This act of faith was a true martyrdom of spirit. Reflection: How easily are you controlled by your feelings? Sister Thérèse felt nothing but loss and interior suffering. Her feelings were dry, dead and painful, but this did not lead her to doubt or despair. She did not turn away from God as a result of this interior suffering. Rather, she used it as an opportunity to make a profound act of faith in God and in Heaven, despite how she felt. How well would you endure such a test? Oftentimes we base our decisions on how we feel, rather than on what we know. Sister Thérèse knew, in the darkness and silence of faith, that Heaven was real and that she loved God and had perfect hope of being with Him in Heaven. God, in His abundant mercy, allowed Sister Thérèse to manifest this profound faith by stripping her of all interior consolation, so that the manifestation of her faith, hope and love were pure. Reflect upon how easily you allow your feelings, or lack of feelings, to determine how you live. Reflect, especially, on how what you feel controls your life of virtue and love of God. Seek to imitate the freewill choice this saint manifested so that you, too, will be purified in your virtue. Dearest Saint Thérèse, in good times and in difficult ones, including the most painful interior desolations, you chose to love God, have hope in Heaven and believe in Him with unwavering faith. Pray for me, that I may imitate your beautiful virtue and may never be controlled by the feelings I experience in life. May I love for the sake of love, believe for the sake of faith, and hope for the sake of hope. Saint Thérèse, pray for us. Lesson: Freedom is rarely understood in its purest form. So often, freedom is understood to be the freedom to do what I want rather than the freedom to do what I ought. True freedom means that one’s soul is stripped of all that hinders it in its rise toward God and that there are no obstacles to faith, hope and love. Sister Thérèse discovered that the “dark night” of deep interior suffering was the greatest gift God could give her because it was through this suffering that her soul was purified and her virtues pruned. Thus, during these months of her life, she wrote some of the most beautiful poetry to God. These poems were an expression of her soul only because her love became so deeply purified by her interior suffering. They were not an expression of any interior consolation. No doubt, dear Mother, you will think I exaggerate somewhat the night of my soul. If you judge by the poems I have composed this year, it must seem as though I have been flooded with consolations, like a child for whom the veil of Faith is almost rent asunder. And yet it is not a veil—it is a wall which rises to the very heavens and shuts out the starry sky. It took several years before Sister Thérèse was ready to enter into this final purification of her soul prior to her earthly death. But in this purification, God took every natural longing of her heart away, and she was left to sing the mercies of the Lord on the level of pure virtue. In this purification, Sister Thérèse also discovered something that we all seek. She discovered freedom: freedom from suffering, freedom from fear, and freedom from everything but love of God. She was free. She was free of all desires other than a desire for God. She was free from all fear in that nothing worried her, not even the most painful suffering. To her, all was sweet and all things became part of her Little Way to Heaven. Nothing of this world and nothing from the evil one could stand in her way. Her freedom was on a level that very few ever attain. Reflection: What is your concept of freedom? Is it that of Sister Thérèse? Probably not. Sister Thérèse discovered a freedom that few discover. She found freedom from everything except love of God. She did not fear suffering, or death, or life, or anything. She suffered greatly and chose love in the midst of that suffering to such a degree that suffering no longer afflicted her. All she knew was love. Reflect upon your attitude toward the suffering you endure. Do you see suffering as undesirable and as an obstacle toward the fulfillment of your happiness in life? Seek to discover the wisdom of the Little Flower and make continual acts of love, despite all you suffer in life. Know that every suffering has the potential to become a glorious gift that will help you discover what it means to be truly free to love and free from all that hinders love. Dearest Saint Thérèse, you discovered the hidden, mysterious and painful road to freedom. Love in the face of all suffering was the one and only way to be rid of all suffering and to find joy in all things. Pray for me, that I may be inspired by the discovery you made and attain the level of love you had for God. May I find freedom as I love and join you in singing the endless mercies of the Lord. Saint Thérèse, pray for us. Lesson: In 1861, the Carmelite sisters of Lisieux embraced a missionary spirit and sent four sisters to Saigon (Vietnam) to begin a new Carmel. From that convent, many other convents were founded in the far East. In 1895, a professed sister of Saigon, Sister Anne of the Sacred Heart, spent time in Lisieux hoping that some of the sisters of Lisieux would return with her to Saigon and from there found a Carmelite convent in Hanoï. Sister Thérèse herself was a perfect candidate, except for her deteriorating health. After much discussion, however, the superiors did not permit anyone’s departure. In pondering the possibility of moving so far from the comforts of home in Lisieux, Sister Thérèse understood that if she were healed and moved to Hanoï, she would be making quite a sacrifice. 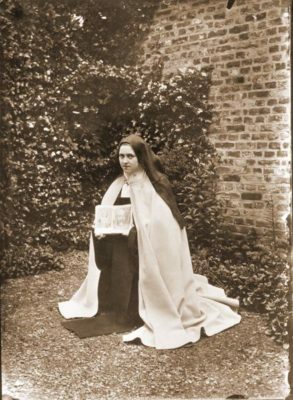 In Lisieux, she was known and loved so deeply. If she were to move to Hanoï, she would be sacrificing the comforts of this love. Though she was never given the opportunity to choose this sacrifice on account of her health, she chose it in her heart and offered the sacrifice of all the love she gave and received at her little heaven in Lisieux. Here, I am loved by you and all the Sisters, and this love is very sweet to me, and I dream of a convent where I should be unknown, where I should taste the bitterness of exile. I know only too well how useless I am, and so it is not for the sake of the services I might render to the Carmel of Hanoï that I would leave all that is dearest to me—my sole reason would be to do God’s Will, and sacrifice myself for Him. At this time in her life, Sister Thérèse’s only desire was to offer herself to God as a sacrifice of love. She sought every bitter chalice she could drink because it was in these sacrifices that her soul was purified and her love was strengthened. Sister Thérèse firmly resolved to say “Yes” to such a mission if her health improved. However, upon making an interior consent, she soon realized that her health would not improve. This was a victory for grace, nonetheless, because her “Yes” was all that God wanted. She would stay in Lisieux until she died, but her willing sacrifice sufficed as a source of much grace. Reflection: When you think of the sacrifices that God might want you to make, do you embrace them willingly? Or do you rationalize and come up with many reasons to avoid these sacrifices? Sacrifice often appears unpleasant at first. But when we see sacrifice as it truly is, as an act of pure love, then we, like Saint Thérèse, will joyfully seek out every sacrifice God invites us to make. Reflect upon any sacrifice in your life that you have been avoiding. Why are you avoiding it? Try to look at that sacrifice not as something painful, but as something beautiful you can offer to God. Resolve firmly, in faith, to say “Yes” to anything God asks of you and strive to do so without any hesitancy at all. Sacrifice is at the heart of love, and love is what you were made for. Dearest Saint Thérèse, you were blessed to see every sacrifice in life as an opportunity for love. The initial pain of each sacrifice was overshadowed by the beauty and power of love. Pray for me, that I may learn to love with a pure heart and that I will say “Yes” to every sacrifice God asks of me. May I, like you, learn to love beyond the hurt and find joy in the total and selfless gift of myself. Saint Thérèse, pray for us. Lesson: Sister Thérèse received many graces during her final years. Among them was the grace to understand the command of Jesus to love as He loved. She noted that this was not just an invitation, it was a “command.” And Jesus would not command something that could not be accomplished. Thus, she arrived at two conclusions regarding this precept of love. First, she understood that “charity consists in bearing all our neighbours’ defects—not being surprised at their weakness, but edified at their smallest virtues.” This was no small task. It was so very easy to see the many faults of her sisters. It was not so easy to look deeper to see all of their virtues. However, Sister Thérèse rejoiced in this discovery and made it her mission to seek out virtue, no matter how small or hidden. If I wish to increase this love in my heart, and the devil tries to bring before me the defects of a Sister, I hasten to look for her virtues, her good motives; I call to mind that though I may have seen her fall once, no doubt she has gained many victories over herself, which in her humility she conceals. Second, Sister Thérèse was aware of the fact that she was not capable of loving her sisters as Jesus loved them; she needed Jesus to do it in her. “Unless within me Thou lovest them, dear Lord!” she exclaimed. This was a beautiful realization for Sister Thérèse, that she could not love her sisters unless it was Jesus loving them within her and through her. Yes, I know when I show charity to others, it is simply Jesus acting in me, and the more closely I am united to Him, the more dearly I love my Sisters. The Lord would not command perfect love of neighbor unless He provided the way. And the way was for Him to love others through us. Sister Thérèse discovered this lesson and fully assented to its practice. Reflection: Toward whom do you need to increase your charity? Whose faults do you dwell on? Perhaps a family member, neighbor or coworker manifests faults that you tend to criticize, either to others or within your own mind. If so, then seek to imitate the precept of love as Saint Thérèse did. First, look deeper and discover the virtue in that person’s soul. It is there, sometimes hidden, but there waiting to be discovered and loved by you. Second, know that you are incapable of love on your own. It is an impossible task. Only if you allow Jesus to live in you and love through you will you be able to fulfill the precept of charity to which you are called. Identify a few concrete situations and at least one person in your life with whom you need to grow in charity. Pray for those you identify and open your heart to God’s grace so that He may come and love through you. Dearest Saint Thérèse, you heard the call to perfect love and responded with your whole heart. You allowed the love of your Lord to live in you and to love your sisters through you. Pray for me, that I may seek to love others as Jesus loves them, relying only upon His love and His Heart living in me. Saint Thérèse, pray for us. Lesson: Sister Thérèse understood well that charity is not primarily something that is felt; rather, it is a virtue that is expressed in deeds. Thus, she set out on a mission of love. She especially sought to show love to those who were most difficult to love. Sister Thérèse did not give in to her natural animosity but instead chose to pray for this sister every time she encountered her. Additionally, Sister Thérèse looked beyond the surface and offered praise to God for the virtues she discovered underneath, praising the Creator for His beautiful creation. Sister Thérèse did not stop with prayer and interior love; she also treated this sister with great affection and expressed her love with such regularity that this disagreeable sister was left confused as to why Sister Thérèse was so kind to her. “My dear Soeur Thérèse, tell me what attraction you find in me, for whenever we meet, you greet me with such a sweet smile.” Ah! What attracted me was Jesus hidden in the depths of her soul—Jesus who maketh sweet even that which is most bitter. What a powerful lesson of love. To love another to such a degree that the other is captivated by your love is charitable. To do so toward one whom you find naturally disagreeable is saintly. Sister Thérèse turned what many people would find divisive into something unifying and holy. Thus, her lesson on the precept of charity was well-lived. Reflection: Is there someone in your life whom you dislike? Does that person know you dislike him or her? If so, then God has given you the perfect person to love with much kindness. Even if you have hidden your dislike well, seek to love that person with much kindness and affection. Who is that person? Or, perhaps several people come to mind. Choosing to love those who are difficult to love is not only a blessing to them, it is also a blessing to you. Seek to bring God’s blessings into your own life and into the lives of those who are difficult, and you will see difficulties transformed by love. Dearest Saint Thérèse, you charitably sought out the sister who was most difficult to love and loved her with your thoughts, words and actions. Your love was pure love, because it was not motivated by delight but by choice. Pray for me, that I may choose to love all people in every circumstance of my life. May I never shy away from love and allow love to transform even the most difficult relationship in my life. Saint Thérèse, pray for us. Lesson: At times, we find ourselves in what could be termed a “lose-lose” battle. During her novitiate, Sister Thérèse found herself in such situations. For example, on one occasion she was unjustly accused of something quite trivial. Though it was minor, she immediately had a burning desire to defend herself. However, she realized that if she gave in to her impulse to defend herself, she would be giving in to pride and lose her peace of mind. On the other hand, she perceived that she was too weak to endure the false criticism. So what was she to do? …my last chance of safety lay in flight. No sooner thought than done. I hurried away, but my heart beat so violently, I could not go far, and I was obliged to sit down on the stairs to enjoy in quiet the fruit of my victory. This is an odd kind of courage, undoubtedly, but I think it is best not to expose oneself in the face of certain defeat. Sister Thérèse manifested a beautiful act of humility by admitting, first to herself, that she was not strong enough in virtue at the time to endure false judgment. She chose to flee “certain defeat.” By fleeing the situation, she settled on the best path open to her at that moment. Of course, as the years went by Sister Thérèse grew in enough virtue to endure even the harshest criticism. But at the time, she knew herself and made the prudent choice to flee from this occasion of sin. Reflection: Each one of us will face occasions of sin in our lives. At times, we may be tempted by others to join in gossip or criticism of another. Or, we might be the object of criticism and will be tempted to anger. At other times, another sin might tempt us, and we might find ourselves too weak to resist. Remember the example of Sister Thérèse in those moments. Flee, run, hide and humbly admit you are too weak to endure the temptation. Fleeing may not be the most virtuous act of courage in the face of sin, but it might be the safest. Reflect especially upon any regular situation you encounter in which this method might be your best option. Do not be ashamed to admit your weakness and your past failures. And do not be too proud to admit that this is your best option at times. Seek to imitate the humility of Sister Thérèse, and you will be on the path to greater virtue. Saint Thérèse, you were aware of your weakness and your need to flee from an occasion of sin rather than to be drawn into a situation of certain defeat. Pray for me, that I may have the wisdom necessary to flee from occasions of sin when I know I lack the virtue to stay and fight. May this prudence guide me as it did you, so that I can continue down the path of virtue to which I am called. Saint Thérèse, pray for us. Lesson: Sister Thérèse and her Carmelite sisters took a vow of poverty. With this vow they renounced all personal possessions and considered all that they used as belonging not to them but to God and the community. For example, when referring to her cell, she called it “our” cell. Her lamp was “our” lamp, and everything else she used was not hers but was shared by the community. This act of poverty helped each sister grow in detachment to all things of this world. However, Sister Thérèse slowly came to discover a new form of attachment within the community which demanded a new form of poverty. This new poverty was in regard to “gifts of the intellect” and every good idea spoken of among the sisters. Sister Thérèse had many deep insights, and she shared them freely among her sisters. At times, she noticed that a sister would repeat the “word of wisdom” without attributing it to Sister Thérèse. In pondering this, she realized that this was a new form of poverty, an intellectual and spiritual poverty to which she was called. Her ideas were not hers at all, they were God’s, and because they were God’s, they were given to all the sisters to use as their own. If it happens that a thought of mine should please my Sisters, I find it quite easy to let them regard it as their own. My thoughts belong to the Holy Ghost. They are not mine. This new poverty of Sister Thérèse was also an act of great humility. Humility is this: we know the truth about ourselves, and the “truth” is that all wisdom and goodness are from God. Understanding this allowed this saintly sister to consider all of her thoughts as “our” thoughts. Reflection: Though most of us are not called to a vow of poverty, we are called to the same spiritual and intellectual poverty to which Sister Thérèse refers. She discovered that God would inspire her at times with much wisdom. When she shared that wisdom, it was tempting to want others to acknowledge where it came from. But where did it come from? It came from the Holy Spirit. Reflect upon those ideas, activities or acts of charity to which you have devoted much time and energy. Do you seek to possess these as your own or are you able to point to God as their origin and source? Seek to give God all the credit for the good in your life and give to Him all the glory. This form of spiritual poverty will not be the cause of loss in your life; it will be the cause of much gain as you share freely all that God has given to you. 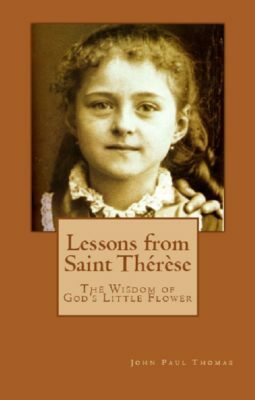 Saint Thérèse, you came to understand that all you had, including every good idea, came from God, belonged to God and was to be used by whomever God so willed. Pray for me, that I may also discover this form of spiritual poverty in life and may never seek to act in a selfish or greedy way. May I see God as the source of all good things and give glory only to Him. Saint Thérèse, pray for us. Lesson: Sister Thérèse was aware of the work of God, the Master Artist, Who was creating various masterpieces in the souls of the sisters. God would use the Mother Superior and Novice Mistress as the “big brush” to form and shape the sisters, but at times Sister Thérèse was used to “fill in the minor details” as a “little brush” of God’s grace and direction. Later, when Sister Thérèse was given the responsibility of guiding the novices, she perceived many ways that God used her as this little brush to fill in the minor details of virtue within the souls of her sisters. God did all the work; Sister Thérèse was simply a small instrument of the Master Artist. From afar it seems so easy to do good to souls, to teach them to love God more, and to model them according to one’s own ideas. But, when we draw nearer, we quickly feel that without God’s help this is quite as impossible as to bring back the sun when once it has set. We must forget ourselves, and put aside our tastes and ideas, and guide souls not by our own way, but along the path which Our Lord points out. Reflection: God wants to use you in countless “little” ways to help others grow in virtue and holiness. Sometimes we have “visions of grandeur” and come up with ways in which we will do great things for God. But God does not need a new “Master Artist.” He and He alone fulfills this role. What He needs is “little brushes” through whom He can help be attentive to the smallest details of life. Reflect upon your mission to imitate Sister Thérèse in being a little brush. Seek to be open to the many ways that God might want to use you. Doing so takes humility, since many of the tasks God gives us are small and hidden. Are you willing to be used for such tasks? Reflect upon being this “little brush” in imitation of Sister Thérèse and, as you do, rejoice that you are so privileged to be able to be used for such small things. Dearest Saint Thérèse, you embraced the humble yet important role of being a little brush in the hand of God. As you did, God used you to help your sisters grow in virtue, even in the smallest of ways. Pray for me, that I may also offer myself to God, the Master Artist, so that He may use me as He wills. May I be a willing instrument of His love, mercy, correction and grace as He so deigns. Saint Thérèse, Pray for us. Lesson: Being used as God’s “little brush” to help paint the beautiful virtues of Heaven on the souls of her “little flock” of novices entrusted to her care was indeed a great privilege of Sister Thérèse. She embraced this responsibility with fervor, and there was little chance she would ever be accused of being “the hireling . . . who seeth the wolf coming and leaveth the sheep, and flieth” (John 10:12). She was diligent in her care and noted, “…what costs me more than all is having to observe their faults, their slightest imperfections, and wage war against them.” But waging war on their imperfections out of love is exactly what she did. As with any family, a parent discovers that what works with one child doesn’t always work with the other. Sister Thérèse discovered this same truth as she waged her war of love, allowing God to use her to form her little lambs. With some I must humble myself, and not shrink from acknowledging my own struggles and defeats; then they confess more readily the faults into which they fall, and are pleased that I know by experience what they suffer. With others, my only means of success is to be firm, and never go back on what I have once said; self-abasement would be taken for weakness. Sister Thérèse loved with such depth that the Great Master Artist could use her in the most varied of ways. This “little brush” of God’s mercy was truly a dedicated brush, accomplishing the most beautiful works of love by waging war on every spiritual imperfection that kept these little ones from divine union. Reflection: When we love God above all things, this love cannot be contained. We cannot keep God to ourselves. Sister Thérèse discovered this lesson of love and fully dedicated herself to her little lambs, drawing out their smallest virtues and seeking to eliminate their slightest defect. Do you love God with such depth that His love overflows from your heart to the hearts of others? Whom has God entrusted to you to care for, guide and form in His ways? Are you willing to let God use you in the way that others need, setting aside your own will, your own preferences and your own ideas so that God’s will can be accomplished? Reflect upon your love of others, especially those closest to you and those within your own family. Surrender yourself more deeply to the task of love and allow yourself, like Sister Thérèse, to be used to help others grow into the perfect masterpieces God is creating them to be. Dearest Saint Thérèse, God used you in many and varied ways. At times you were severe, and at times you humbled yourself before others. Pray for me, that I may be used by God in accord with His perfect plan of love. May I act as an instrument of His love so that the love in my heart will overflow into the lives of others. Saint Thérèse, pray for us. Lesson: As a novice, Sister Thérèse recalled a blessed opportunity she was given to show an ongoing act of charity toward one of the elderly sisters. Shortly before Sister St. Peter became quite bedridden, it was necessary every evening, at ten minutes to six, for someone to leave meditation and take her to the refectory. It cost me a good deal to offer my services, for I knew the difficulty, or I should say the impossibility, of pleasing the poor invalid. But I did not want to lose such a good opportunity, for I recalled Our Lord’s words: “As long as you did it to one of these my least brethren, you did it to Me” (Matthew 25:40). Most people would see this duty as a burden, but Sister Thérèse discovered the hidden act of love to which she was called by patiently and lovingly serving this “poor invalid.” For her daily act of love, Sister Thérèse received criticism from Sister St. Peter. She responded with more than patience; she responded with supernatural charity, which eventually won the heart of this elderly sister. Her love of Sister St. Peter reached a new height when, upon fulfilling the necessary duties to assist her in her frailty, Sister Thérèse went even further. But I soon noticed that she found it very difficult to cut her bread, so I did not leave her till I had performed this last service. She was much touched by this attention on my part, for she had not expressed any wish on the subject; it was by this unsought-for kindness that I gained her entire confidence, and chiefly because—as I learnt later—at the end of my humble task I bestowed upon her my sweetest smile. During one such occasion, Sister Thérèse pondered a clear contrast of experiences. One day, from outside the convent walls, she heard music from a local dance and pondered the enjoyment that those in the town were currently enjoying. She imagined the women dressed beautifully and treated with charm and respect. But her meditation took her further. Then I looked on the poor invalid I was tending. Instead of sweet music I heard her complaints, instead of rich gilding I saw the brick walls of our bare cloister, scarcely visible in the dim light. The contrast was very moving. Our Lord so illuminated my soul with the rays of truth, before which the pleasures of the world are but as darkness, that for a thousand years of such worldly delights, I would not have bartered even the ten minutes spent in my act of charity. Sister Thérèse had discovered the immense joy of selfless service and sacrifice. The value of this act of charity far outweighed anything the world could offer. What a blessing to see these two contrasting situations through the eyes of divine love. Reflection: Each one of us will encounter situations that at first seem to be burdensome, unjust, and at times even impossible to deal with. But those “opportunities” are just that: opportunities. They provide us the invitation to look deeper and discover the hidden value of service in the face of ridicule, disorder, ingratitude and even persecution. How well do you look beyond the veneer of such situations in your daily life? Do you tend to complain about this person or that, about this situation or another? Most often, the situations or persons we complain about are the very situations and persons in which we will discover the greatest joys of life. Love, service, kindness and generosity in the face of ridicule, severity, persecution and injustice is one of the greatest opportunities we are given each day to discover and live the hidden joys of life. Reflect upon what you complain about the most. Try to look at that situation or person in a new way today. Seek to follow the example of Sister Thérèse and allow yourself to discover the blessed opportunity that has been placed before you. Dearest Saint Thérèse, you saw the angry complaints, ridicule and lack of gratitude of Sister St. Peter as a blessed opportunity and invitation to love to the greatest degree. Pray for me, that I may never shy away from opportunities of charity, especially when such an act requires the embrace of injustice. May I choose love above all things and never waver in this decision. Saint Thérèse, pray for us. Lesson: Perhaps you have endured some minor annoyance which, though minor, occupied much of your attention. Sister Thérèse recounts a story of one sister who, during prayer in chapel, would “fidget” constantly. She would move, clang her rosary continuously, and be distracting in numerous ways. Though tempted to express her displeasure with this sister, Sister Thérèse chose, instead, to turn the “fidgeting” into music for the Lord. I kept quiet, but the effort cost me so much that sometimes I was bathed in perspiration, and my meditation consisted merely in suffering with patience. After a time I tried to endure it in peace and joy, at least deep down in my soul, and I strove to take actual pleasure in the disagreeable little noise. Instead of trying not to hear it, which was impossible, I set myself to listen, as though it had been some delightful music, and my meditation—which was not the “prayer of quiet”—was passed in offering this music to Our Lord. On another occasion, a sister with whom she did the laundry regularly splashed Sister Thérèse with dirty water. Again, though tempted to anger, she let go of her annoyance and rejoiced in this little gift from God. Some may say that Sister Thérèse simply made the best of these minor difficulties, but she did more than that. She allowed a temptation to become a source of prayer and grace. Allowing annoyances to become music for the Lord was not just a coping mechanism Sister Thérèse used. Rather, it became a prayer because it was an offering, a sacrifice to God. Prayer is sacrifice, and every temptation we receive or every displeasure we endure is an opportunity for either frustration or grace, anger or mercy, annoyance or prayer. Reflection: What comes to mind as a source of frustration in your daily life? Is there a habit of another, a rule at work, an injustice you daily face that tempts you to annoyance, frustration and even anger? Ponder the “fidgeting” that you encounter on a regular basis and consider the action of Sister Thérèse as the solution. Do you know that every annoyance you encounter is a potential prayer of offering to God? Though this might not be hard to accept, it can be hard to put into practice. As you reflect upon the opportunities in your life to imitate the virtue and prayer of Sister Thérèse, be concrete. Make a specific decision to offer some displeasure to God as a prayer of sacrifice. God will receive it, and you will receive much grace, enabling you to ultimately rejoice in the gift of “fidgeting” you have been given. Dearest Saint Thérèse, you beautifully received the constant annoyance of this sister’s fidgeting as a gift and offered that gift to God as a prayerful sacrifice, a musical hymn of praise. Pray for me, that I will never allow minor displeasures in life to deter me from a life of virtue. May all things truly work for good and become part of the complete surrender of my life to God. I desire that my whole life becomes a beautiful song of praise to Him Who is worthy of all praise. Saint Thérèse, pray for us. Lesson: Sister Thérèse had a deep love for priests and prayed for them often. She pondered how blessed she would have been if she had a brother who was a priest. For years I had cherished a longing which seemed impossible of realisation—to have a brother a Priest. I often used to think that if my little brothers had not gone to Heaven, I should have had the happiness of seeing them at the Altar. I greatly regretted being deprived of this joy. Yet God went beyond my dream; I only asked for one brother who would remember me each day at the Holy Altar, and He has united me in the bonds of spiritual friendship with two of His apostles. Her first priestly brother was Father Maurice Bellière who contacted Carmel while he was still a seminarian, seeking a Carmelite sister to pray for him. The seminarian, L’abbé Bellière at the time, was a subdeacon and a member of the White Fathers. He had been orphaned at the age of three and raised by his aunt. He was twenty-one years old when he contacted Mother Agnes of Jesus, asking for a Carmelite sister. The year Sister Thérèse adopted her first brother, the Carmelite sisters received a request from Father Adolphe Rouland of the Society of the Foreign Missions that he receive a spiritual sister. Once again, Sister Thérèse was assigned the task. Two brother priests! What a blessing to her she thought. However, at that time, these two priests had no idea how blessed they were to have received the gift of such a spiritual sister. Sister Thérèse prayed fervently for these two brothers but did more than that. Though she had great respect and admiration for the priestly office, she did not shy away from offering advice, correction, teaching and spiritual exhortations to her brothers. Her respect for them and for their mission led her to take her spiritual sisterhood seriously, doing all she could to assure their sanctity. Most notable was the joy in which she received her new brothers. Mother, I cannot tell you how happy this made me. Such unlooked-for fulfillment of my desire awoke in my heart the joy of a child; it carried me back to those early days, when pleasures were so keen, that my heart seemed too small to contain them. Years had passed since I had tasted a like happiness, so fresh, so unfamiliar, as if forgotten chords had been stirred within me. Sister Thérèse was ecstatic at the thought of having a priest as an adopted brother. This did show her love for the priesthood, but it even more clearly showed her love for Christ and for the way that He comes to everyone through the priest. Reflection: Though not all of us will be given a special relationship with a priest, we must all cherish those whom God does put in our lives. Whom has God given to you to love and care for in a particular way? For most people, these special friendships are those within their own family. Do you see the people in your family as gifts from God for whom you must pray, encourage, support and exhort in holiness? Sister Thérèse was thrilled to have two priests as adopted brothers, but we must all be just as thrilled to have our parents, grandparents, children, siblings and other relatives as our true brothers and sisters in Christ. And if God has placed a desire within your heart to pray for priests and to adopt one as a “spiritual brother” in Christ, see this as a blessed invitation to support them in their sacred ministry. Though the Carmelite mission was especially focused on prayer for priests, we are all called to pray for them. Reflect upon the joy in the heart of Sister Thérèse as she loved her priest brothers and work to foster that same joy in your heart toward your family. They were given to you as a gift from God. You must love them, care for them and do all you can to help them fulfill their mission on Earth and attain the joys of Heaven. Dearest Saint Thérèse, you counted it as pure joy to receive these two priests as your spiritual brothers. You prayed for them, supported them and taught them your “Little Way.” Pray for me, that I may be filled with joy over those God has put into my life. May I do all I can to love them and care for them so as to help them on their way toward the fulfillment of their holy mission. Saint Thérèse, pray for us. Lesson: Sister Thérèse spent much of her later years in the convent giving herself in love to her “little lambs” and to the two priests whom God entrusted to her sisterly care. In addition to them, she felt a strong draw to love and pray for all missionaries and for the entire Church. One day after Holy Communion, Sister Thérèse reflected upon the Canticle “Draw me: we will run after Thee to the odour of Thy ointments” (Canticle 1:3). In pondering this Canticle, she was especially drawn to the prayer “Draw me.” As she pondered this prayer in light of the love she had for those whom God had entrusted to her care (her sisters, her brother priests, all missionaries and the whole Church), she was aware of the fact that she could not possibly know every one of their needs to sufficiently present each need to God. However, Sister Thérèse did discover that if she loved them with the deepest love, then their souls also would be drawn to God as she ran toward Him. O my Jesus, there is no need to say: “In drawing me, draw also the souls that I love”: these words, “Draw me,” suffice. When a soul has let herself be taken captive by the inebriating odour of Thy perfumes, she cannot run alone; as a natural consequence of her attraction towards Thee, the souls of all those she loves are drawn in her train. Thus, Sister Thérèse discovered that the best way to pray for souls was to love them, carry them in her heart, and then allow her heart to be drawn to God. In doing so, she understood that this was the best way to pray for souls. She further reflected upon the great prayer of Jesus Himself from the Gospel of John. I pray for them: I pray not for the world, but for them whom Thou hast given me, because they are Thine. And all mine are Thine, and Thine are mine; and I am glorified in them. And now I am no more in the world, and these are in the world, and I come to Thee. Holy Father, keep them in Thy name, whom Thou hast given me, that they may be one, as we also are one (cf. John 17). Jesus loved those whom the Father entrusted to Him, and He prayed for them by coming to the Father with them in His Heart. As Jesus was one with the Father, so also His union with the Father brought forth the union of those He held in His Heart with the Father. Sister Thérèse discovered that she, too, must carry those whom God had entrusted to her in her heart and she was to offer her heart to God. In doing so, she offered those she loved to God. The offering of her heart and the offering of those in her heart were one and the same act of offering. Reflection: God entrusts to each of us specific people whom we must love with profound love. He has entrusted specific people to us more than others. We will never offer them a greater act than to love them dearly, hold them in our heart, and offer that heart to God. Whom has God given to you to love in a special way? Spouses especially are called to this love, as are parents. From time to time, God also might entrust other souls to your love. You might not be able to solve all their problems, understand every one of their needs or be there for them every time they fall. But you are able to love them so deeply that you carry them in your heart. Reflect upon those you do carry in your heart. As you call them to mind, reflect also upon the words “Draw me.” Hear God call to you, drawing you to Himself. Know that, as you go to Him and surrender your heart to Him, you are entrusting those special souls in your life to God. This form of prayer is the best prayer of intercession you can offer. Dearest Saint Thérèse, you loved those whom God had entrusted to you with a deep and burning love. You carried them in your heart and offered that holy heart to God, also entrusting those whom you loved to God. Pray for me, that I may also love those whom God has entrusted to me with the deepest love. As I carry them in my heart, may I offer my heart to God as He draws me, so that my heart and those whom I love will be united to God in pure love. Saint Thérèse, pray for us.